DISCLAIMER: Some electronic equipment operates on very high voltages. Electricity can be LETHAL. Do not attempt to disassemble, repair, or modify any electronic equipment unless you are qualified to do so. The purpose of this site is only to provide helpful information. The owner of this site is not responsible for any damage to persons or equipment resulting from misuse of this information. Let’s begin by getting a few things straight. I would call myself a project studio owner. I use my studio for voiceover demos and production, my own music, a few friends’ projects, and the occasional paying gig. I have an average amount of knowledge concerning gear and try to purchase a level of quality that allows me to only buy things once and not continually upgrade. However, I am not made of money. So along the weedy path I walk, trying to discern between the wheat and the chaff. Sound familiar? 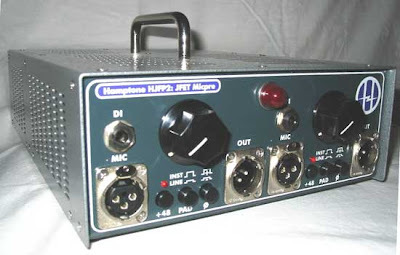 I came across a tube mic preamp project from Hamptone in an issue of TapeOp. I emailed the owner, Scott Hampton, and he told me he will be writing a new article based on a JFET design and subsequently offering it in kit form. I read the article when it came out.read a few comments about Scott and his older tube design, read some more about his silver box product, and read even more from people who are beginning to make circuits based on his designs. So, I did something fairly uncharacteristic of me. I decided to buy something without either hearing it first or gathering countless opinions of people more knowledgeable than myself. My thinking was: 1. Hamptone products already had a good sonic reputation; 2. I really wanted to learn more about electronics and signal flow; 3. If it worked out, I could have a better product at a smaller price. The Hamptone HJFP2 is really two different products: The kit and the preamp. The kit is a complete, over 250 components that you assemble from the circuit board up. The preamp is a two channel JFET based microphone preamp with a DI, phantom power, pad, and phase switch. Below you will find my thoughts on both portions broken out separately. Remember, this is a package deal. If either section is not for you, then look elsewhere for a preamp. There is risk in shelling out good money for something that theoretically could be worthless after you get done. It is important that you weigh the pros and cons carefully before making a decision. Hopefully, I can make your decision easier one way or another. After much anticipation, the kit showed up at my door in an unassuming, brown box. Carefully removing the tape (note I'm being saracastic as I ripped it open), I opened the box and removed the contents. Inside were the chassis pieces, components in small bags that were labeled by their general purpose and 16 pages of instructions, drawings and a parts lists. I settled down to begin putting things together, pulled out the instructions, and read “Populate all the resistors..." What? This might be tougher than I thought. I am not an electronics expert. I can solder my way out of a paper bag if necessary and know how to turn a DVM on but I had only limited experience at identifying resistors and even then it was two or three at a time. This was a whole bag of them. So, I went to the internet, found some color stripe charts, and started to separate them based on value. Some colors were tough to distinguish but eventually with the help of the parts list, I had all of them divided up and accounted for and I could finally begin to populate and solder. After this first obstacle and subsequent victory, I finally got it through my head that this was not a beginner's kit. It assumes at least some previous experience and knowledge. I had already warned my electronically minded friends that I might need answers or even help so they were ready for me when I came with questions. I think I could have gotten through it without them but they certainly helped speed the process along. Things went much smoother after that initial shock. Populate and solder, populate and solder. It was gratifying to watch things come together and know that, "Hey, I did that." The hardest part was taking the time to double check diode orientation, capacitor polarity, solder joint quality, etc. I did run across a couple of issues where the parts list didn not match the directions or the pictures. I would put an email in to Scott Hampton and just start working on another part of the kit while I was waiting for an answer. All of my problems were quickly resolved by Scott via email who sometimes answered within an hour. Before I was done, Scott had even sent out a revised parts list fixing all known issues and updated his website with a number of frequently asked questions. Testing of the subassemblies called for some fairly specialized equipment. Namely, a variac, which is a device that allows you to slowly ramp up the input voltage and allows you to stop the process if something is obviously wrong and keep the damage to a minimum. This is not 100 percent necessary but I was fortunate enough to have access to one at my work but most other people I have talked with just "plugged it in and fired it up." Testing went smoothly until it came time to plug a microphone in and see what happened. One channel was fine but the other strangely had too much gain. Troubleshooting was relatively painless since I literally knew my preamp inside and out. I took a look at the likely culprits, comparing assembly of the good channel to the bad and figured out I had wired my gain pot backwards. I unsoldered the wires, flipped them around and re-soldered them in the correct position. Problem solved. Once I was done testing, all that was left was to put the cover on and start tracking. The entire assembly probably took close to 15 hours. I took my time and that figure includes all the research, question asking, and blank stares. I would say that the kit was well thought out overall. The only gripes I have are with the instruction package which needs some improvement. In its current state it will get you from A to B, but it could be much better. The package included written instructions, component layout drawings, trace drawings, and parts lists. With some common sense and a little deductive reasoning you can get by just fine, but I would like to see something a bit more foolproof. The pages could be labeled better with the instructions pointing you exactly to where you need to look. But honestly, this is something that could evolve over time and should not deter anyone from attempting this project in the meantime. I am going to try my best not to describe the sound of this pre by itself. Instead, I am going to draw comparisons to another popular in this price range, the FMR RNP. The RNP is a solid preamp with a deservedly great reputation. It has its limitations, but FMR is very forthcoming about those on its website. Most people have either heard the RNP or heard enough about it to make a decent comparison. The Hamptone HJFP2 is a two channel microphone preamplifier housed in a 2U high, half rack wide case and uses custom input and output transformers. There is a removable handle for location work that will bring the overall height to 3U if used. Each channel has an individual 48v of phantom power, pad, and phase switch. The HJFP2 is based around a JFET design and the basic circuit (minus a few evolutionary changes) was published in a recent issue of TapeOp magazine. The construction of the case is tremendously rugged and the faceplate is stylish but very simple. The construction of the entire assembly is, of course, up to you. I said I was going to try not to describe the sound but Scott Hampton of Hamptone said, "If I had to draw some comparison, it would probably me more like a 1272 than an API, but it really is its own thing." Based on my somewhat limited use of those pres I would have to agree, but I'm starting to get sucked into the subjective description game aren’t I? Compared to the FMR RNP, the Hamptone was more present and a bit more focused in the low end. The RNP seemed to bring out the transients while the HJFP2 was more of a smooth sound. The Hamptone was slightly better at front to back separation and sounded bigger overall. The RNP seemed a little more natural except for the heightened transients. In fact, if I were to draw a line between clean and colored, I would put the Hamptone just about as far on the colored side as I would put the RNP on the clean side. Neither one was hyper clean or overly colored but were in fact a good complement to each other. One notable characteristic for me at least was that the HJFP2 was noticeably quieter than the RNP at high gain levels. Both pres responded favorably to condensers, dynamics and ribbons, which is a tribute to the quality of both pres. However, the Hamptone warmed up to my AEA R84 quite well due to the lower noise and higher useable gain. Even with the increased low end, the HJFP2 never got muddy in any of my tests nor did the RNP get brittle with its high end. On finger picked acoustic I like to get as much transient as possible so the RNP was my choice. For strummed acoustic, I liked the power of the HJFP2. Male vocals were evenly split and very source dependent, but for female vocals I leaned heavily toward the Hamptone. For some reason, my EV 635a took the sound of each pre and magnified it. Things that the 635a smoothed out before were like butter with the Hamptone. The same mic was almost condenser like with the RNP. Of course, I have only had the HJFP2 for a few weeks so source material isn't as diverse as I would like but I think I have done enough to make a valid analysis. Again, this product is a package deal. You cannot currently separate the two sides of the coin: The kit and the preamp. The only thing complex about the kit is in the sheer number of parts and steps. I would say that if you are fairly comfortable soldering on a circuit board you will be fine. If you have done that much before, then you are probably familiar with some of the other things like the measurements and the wiring this kit requires. I have only minor suggestions for the instruction layout and there is not a showstopper in the bunch. The preamp is wonderful. It is clean enough to be the backbone of a small project studio but colored enough to give you variety if you already have the clean thing covered. The sound quality easily raises the bar for preamps at its price point. In fact, I would say that for two channels, it might raise the bar at double the price. If you haven't noticed, the price for quality two channel preamps has been on the rise lately. The Hamptone HJFP2 slips in nicely by taking the cost of labor out of the equation. It's not a free ride, but who said the best things in life are free? 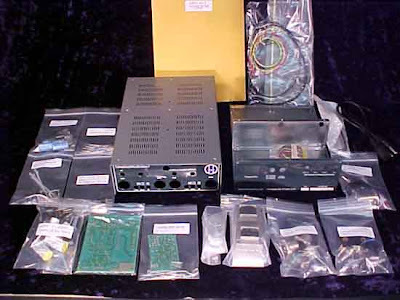 The Bottom Line: Hamptone puts out a kit that lets you put together a quality preamp and a reasonable price if you got the time and patience to put together a kit. Recommended.